This post is part of a virtual book tour organized by the publisher. Leave a comment for a chance to win a copy of Nobody Has to Know. Click the tour banner above to see the other stops on the tour. Long and Short Reviews welcomes Frank Nappi, whose newest book is now out. 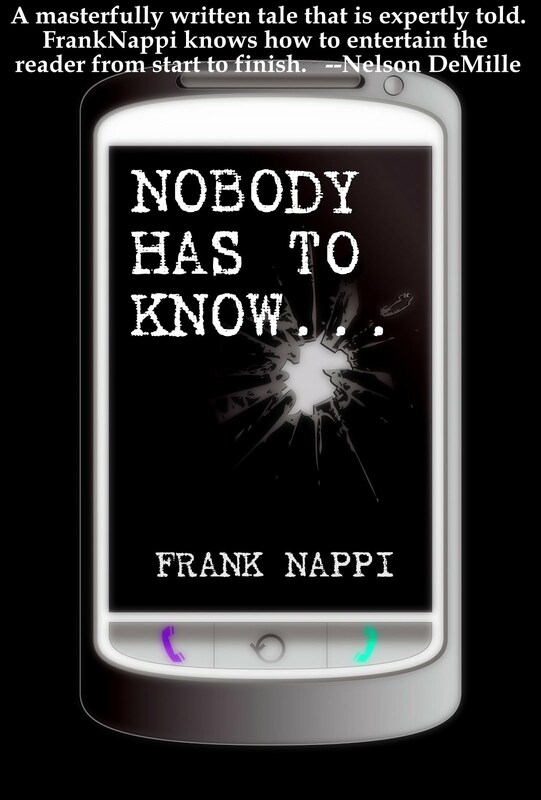 Nobody Has To Know, Frank Nappi's dark and daring new thriller, tells the story of Cameron Baldridge, a popular high school teacher whose relationship with one of his students leads him down an unfortunate and self-destructive path. Stalked through text-messages, Baldridge fights for his life against a terrifying extortion plot and the forces that threaten to expose him. Nobody Has To Know is a sobering look into a world of secrets, lies, and shocking revelations, and will leave the reader wondering many things, including whether or not you can ever really know the person you love. LASR: What inspired you to start writing? Frank: I feel as though I have always had the desire to put words on paper. It goes way back for me. I have a vague recollection of when I first began writing. I can remember writing a story when I was very young - maybe five or six years old. It was about a king who rescues a girl and makes her his queen. Not really sure where the idea came from, or even how good it was. I just remember my mom typing it for me when I was finished and that image always makes me smile. As time went on, this very powerful, ineffable need to write led me to the publication of several short essay pieces in Newsday’s “500 Words or Less” column. This was very gratifying for me but only fueled this desire to produce more substantial work -- something like a novel. However, as the cliche goes, I lacked the proper muse or inspiration. I just did not know what it was I was going to write about. And I did not want my first effort to be gratuitous in any way; it needed to be something poignant, something close to my heart. Then I met two very special WWII veterans - Mr. Bill McGinn and Mr. Eddie Hynes -- during a Veterans Speaker Program that I initiated at Oceanside High School for my classes, I was moved like never before. The stories they told me, and our subsequent friendship, became the basis for my award winning Echoes From The Infantry. I have been writing ever since. Thank you Bill and Eddie. LASR: Who is your favorite author and why? Frank: My favorite author is probably the favorite author of every writer - or at least he should be. F.Scott Fitzgerald was a linguistic genius. He understood the rhythm of the written word the way a composer understands musical notes. There is such an ease and natural flow to his work - tantamount to the way the birds sing. It’s seamless, beautiful and moving. The Great Gatsby, his signature work, embodies all of these qualities like no other work of American fiction. Many of Fitzgerald’s shorter works possess this same artfulness. LASR: Tell us something about your newest release that is NOT in the blurb. Frank: Well, as you know, Nobody Has to Know is a dark and somewhat daring psychological thriller that, tells the story of Cameron Baldridge, a popular high school teacher whose relationship with one of his students leads him down an unfortunate and self-destructive path. Stalked through text-messages, Baldridge fights for his life against a terrifying extortion plot and the forces that threaten to expose him. Nobody Has to Know is a sobering look into a world of secrets, lies, and shocking revelations, and will leave the reader wondering many things, including whether or not you can ever really know the person you love. On a more profound level, Nobody Has To Know illustrates how the landscape of our past influences our present and how, sadly, some of these more indelible moments hold us prisoner for the duration of our lives. However, what few people realize is that the ending of the original story was very different. I will not go into too much detail for obvious reasons, but I will say that initially, much of the “action” in the story was revealed to the reader at the end as “just a dream sequence.” It wasn’t until I realized that readers might feel cheated and/or duped that I decided to alter it. LASR: Describe your writing space. I suppose my writing space is not that unlike those of other authors. Well...maybe that’s not entirely true. I do most of my writing in my office at home, a modest room with walls adorned with my most treasured baseball memorabilia, highlighted by a beautiful 16X20 black and white Cooperstown signed photo of Ted Williams which hangs right over my desk. I have other wonderful items in the room as well, including game used spikes signed by Tony Gwynn, an autographed Sports Illustrated cover celebrating Hank Aaron’s 715th home run and two Shea Stadium seats that I acquired after the Mets shut down the old place. There’s lots more as well. My actual desk is littered with items you would expect any author to have handy -- some practical and germane to the writing process and some which hover I suppose in the realm of the idiosyncratic I suppose. I have plenty of pens and pencils, a clock, an old fashioned dictionary, and other office supply stuff like paper clips, tape, staples, etc. The more colorful items cluttering my desktop include a tiny wooden Hemingway House replica I bought while in Key West, a 12 inch Batman figure, New York Met Bobblehead, San Diego Sno Globe, lots of loose family photos and an F.Scott Fitzgerald magnetic finger puppet I received as a gift. It is quite an odd amalgamation of things but it works for me! LASR: What, in your opinion, are the most important elements of good writing? Frank: Well writing is a broad term; it includes everything that is written. If you are asking about what makes a novel a good novel, that is a little more manageable. In any great work, one that resonates with the reader, there needs to be authenticity with regard to the characters. If a reader does not invest in the characters, the author’s message is lost. It is my experience that “real characters” think and act just as real folks would. There is nothing contrived about their existence – their words and emotional responses to situations are emblematic of those of real people. This can be accomplished in part through the use of flashbacks, which become windows into the psyches of these individuals. If a reader knows where a character has been, where he is presently becomes far more plausible. I also feel that attention to craft in language is essential to capturing an audience. The way someone tells a story is at times as important as the story itself. LASR: What comes first, the plot or characters? Frank: That is an excellent question, one that so many of the students in my Creative Writing classes ask all the time. The truth is, it happens both ways. My first novel, Echoes From The Infantry, began with a very complex character who suffers from the insidious residue of WWII. He was fully developed in my mind before I ever wrote one word. The fictional framework came later on. In the first Mickey Tussler novel, it was just the opposite. I had already written a first chapter before I ever really knew exactly who my protagonist was going to be. The same is true for my latest novel, Nobody Has To Know. This is the beauty of the writing process. Stories come from so many different places and are executed in so many different ways. LASR: What is a talent you wish you had, but don't?" Frank: The ability to play the piano. I love piano music. LASR: Weather: Hot or cold? Frank: Definitely hot. If I never saw another snowflake again I would be just fine. LASR: What is one thing your readers would be most surprised to learn about you? Frank: I am milk phobic. It’s a long story, but it involves a rather tepid container of expired milk and a tyrannical first grade teacher. Enough said. LASR: Tell us about the absolute BEST fan letter you have received. Frank: About a year after Echoes From The Infantry was published by St. Martin’s Press,I received an email from a man in Tennessee. His letter was not so much one of admiration for my writing as it was a confession of sorts. It seems that this gentleman grew up with a WWII veteran for a father -- a man who resembled very much my James McCleary. His relationship with his father was fractious and strained in ways similar to what I described in the book. However, his father passed away before he ever had the chance to reconcile some of these feelings that existed between the two of them. Even though this gentleman from Tennessee knew my story was fiction, he was able to gain insight into his father's mien and temperament and used the book’s ending as a vehicle through which he could finally obtain closure and move on. He told me that my novel saved his life. I’m not sure that I will ever receive another letter that will mean more to me than this one. LASR: Have you ever eaten a crayon? Frank: Not to my knowledge, but I think I swallowed a fairly large piece of a cherry Chapstick once and I am not ashamed to say it tasted pretty good. About the Author:Frank Nappi has taught high school English and Creative Writing for over twenty years. His debut novel, Echoes From The Infantry, received national attention, including MWSA's silver medal for outstanding fiction. His follow-up novel, The Legend of Mickey Tussler, garnered rave reviews as well, including a movie adaptation of the touching story "A Mile in His Shoes" starring Dean Cain and Luke Schroder. Frank continues to produce quality work, including Sophomore Campaign, the intriguing sequel to the much heralded original story, and is presently at work on a third installment of the unique series. Frank lives on Long Island with his wife Julia and their two sons, Nicholas and Anthony. Thanks Judy for featuring Frank's latest suspense thriller! P.S. For early December, Frank is donating all of the proceeds from the sale of 'Nobody Has to Know' to support recovery efforts from Hurricane Sandy. His own community where he teaches high school English, Oceanside, was devastated by the storm. I love F Scott Fitzgerald. He is amazing.